Dubai moved a step closer to resolving its debt problems with the announcement of a plan to invest $9.5 billion to restructure its flagship conglomerate, Dubai World, and its property developer, Nakheel. Major creditors reacted positively to the plan, which offered to repay two key bonds and give lenders their money back in up to eight years. The International Monetary Fund said it supported the authorities' efforts to find a fair and equitable solution. "A satisfactory conclusion of this process will pave the way for improving overall credit conditions, the investment climate and economic activity in the Emirate of Dubai and the UAE," the IMF said in a statement. According to Dubai's Department of Tourism and Commerce Marketing (DTCM), confidence is already returning to the emirate. DTCM points out that Dubai continues to attract more than half of the foreign direct investment (FDI) projects in the Gulf Cooperation Council (GCC) region and that at the end of 2009 there were 363 FDI projects, more than the total number of projects in 2007. It also anticipates further FDI inflows when the emirate's new Federal Foreign Investment Law, which grants full foreign ownership of companies, is implemented. In its 2010 report on FDI confidence, management consultant A.T. Kearney, which surveyed senior executives from top global companies, says despite the negative publicity around Dubai World, the UAE held up well and was ranked as the 11th preferred FDI destination, with Dubai as the "preferred entry point." But according to the 2010 Global Financial Centers Index (GFCI), published by Z/Yen, Dubai tied for 24th place with Isle of Man out of a total of 75 centers, representing a slide of three points in its ranking from the 2009 GFCI. However, its actual rating rose slightly from 2009's result. 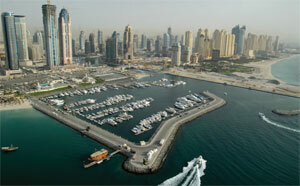 Z/Yen puts Dubai among the emerging global contenders, alongside cities such as Beijing and Shanghai.